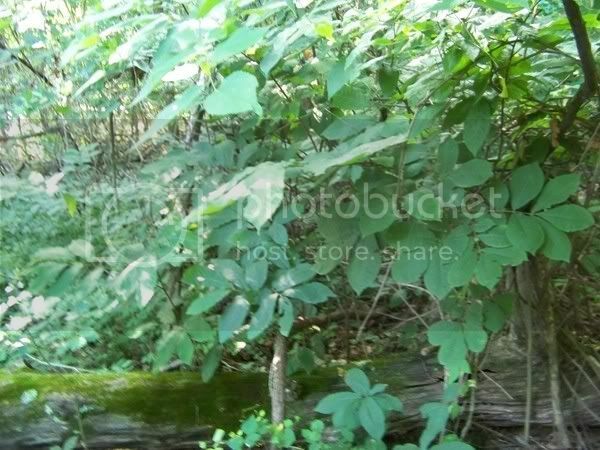 I have a few un-named Asimia Triloba ( Paw Paw ) that are doing fine in dappled shade. My question is to anyone who might grow them. I want to get a PA Gold and a few other hybrids but am uncertain how far minimal spacing can be. Should I expect the growth rate to be the same or will one variety overcome any others in the bunch?? Does anyone actually grow Paw Paw?? It sounds so cool in the catalogs but isn't that usually the case. I grow paw paw! In nature it tends to grow in colonies pretty close together. I don't know about in one spot, but if you space them a yard or so apart, should be fine. I have now 5 little paw paws. One is I think about 6 yrs old, taller than I am and doing well and has bloomed the last couple years. The next two are about 4 years old and 4' tall, have not bloomed yet. The other two are tiny babies that I planted last fall. So I have yet to see any paw paw fruit, because the one tree blooming isn't getting pollinated. Also paw paws have separate male and female trees, but when they sell them to you, they can't usually tell you which you are getting. So you just have to assume that by the time you have a few trees you will have both types represented. I'm still waiting for my seedlings to grow up enough to produce and hopefully both sexes will be represented. I WAS under the impression that any named cultivars would be grafted females because they always seem to sell seedlings for pollination at half the price. I heard that the best way to insure your flowering Paw Paws get pollinated is to put a road kill in the grove. Apparently they get pollinated by flies more so than by bees. I was remiss in researching Asian Persimmon. I purchased a pretty large one last year because they TOLD me it was self fertile. A little on-line research confirmed the Asian Chocolate IS not self fertile. I do have a couple more persimmons (asian) in the nursery so hopefully they will be compatable. I would love to see some pics of America Persimmon or Paw Paw either in their native habitat or in one of your gardens. Anyone have them??? These photos were taken June 28, 2010. See the fruit up high in the air? 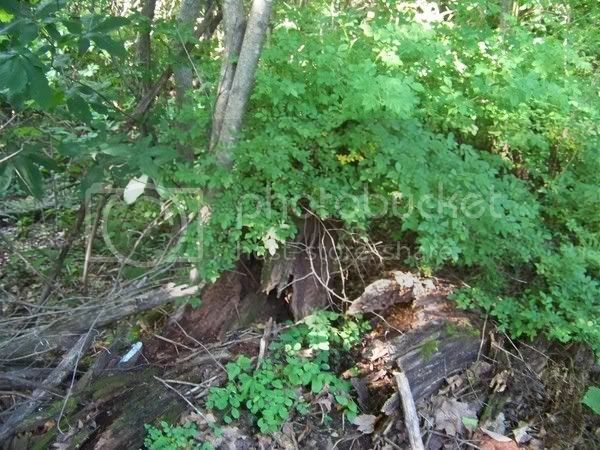 This is the base of the trees in the first photo, see the wild rose and dead tree that is like sawdust in texture, lots of leaves there too. This shows how close together they grow in nature. They are all in dappled shade, more shade than sun. But the fruiting ones get late afternoon sun. TY Lady.. They sure do look like they don't mind being in a clump. Will you eat the fruit or will the critters get them first. They just make them sound so tasty!! How big will the fruit get on yours?? Are they a native for you?? Keep me in mind for later on in the year. I would love some seed and I always have sumpin to share. I did buy stratified seeds of Fleabay last year and I planted them to deeply. When I dumped them they had sprouted but just never made it to sunlight. Will even try sending you a plant out of the baby nursery. What are you? Z7? I wish I covered all the zones on my two acres. SIGH!! I'm a Z6b most years but a straight Z6 winter will wreak havoc on my babies. I am zone 6b to 7a. Officially 6b due to elevation, but the huge lake modifies it to a 7 with its warming effects in winter. We eat them, and this is just one patch. My youngest son said that he will make the trip down the valley to get some from the other trees as soon as these begin to ripen. We all love them, natural growing bananas! These are all native, wild trees. I take photos regularly, because when they get ripe they will be gone fast. They will have the look and size of a baking potato, but feel like an avocado when ripe. They will shelf ripen too, if close enough when picked. We just came through one of the worst winters that anyone can remember with ice, snow and very low temps. And all of the fruit is doing exceptionally well, both wild and domestic. I would say these wild ones will grow great there, zone 6 shouldn't faze them at all. And the leaves stink pretty bad already, I shouldn't think you would need something dead to draw flies! But, perhaps a rotten potato hung there? Anything that will attract more bugs might work. I do nothing, let nature deal with it, seems pretty efficient to me. I just planted some PawPaws this year... so, I am "learning as I go" too. One source that I read, suggested a spacing of at least 8 feet for new plantings. 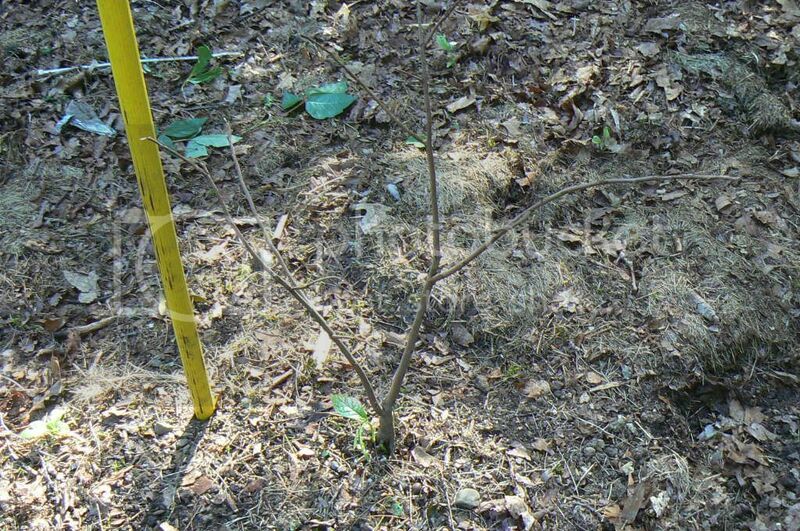 They also indicated that as the plantings "matured", the PawPaws would tend to naturally develop their own "patch", by "filling in" additional trees between those that you planted. Here's a quote from the article I had read... "Pawpaw trees are prone to producing root suckers a few feet from the trunk. 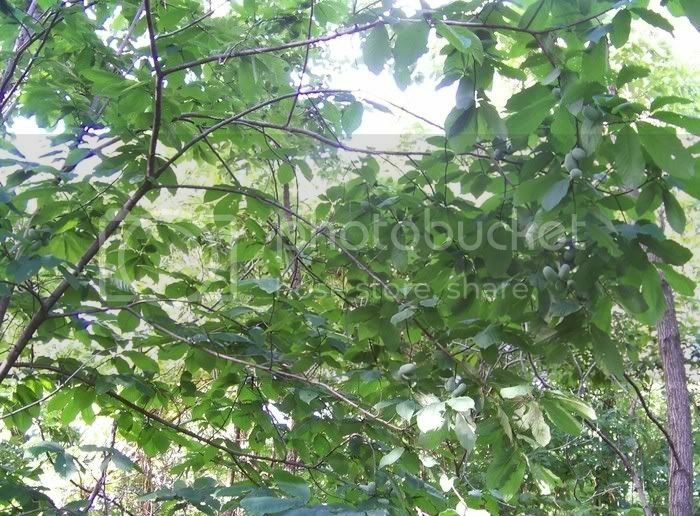 When these are permitted to grow, the single-clone Pawpaw patch comes into being." Their tendency to fill in amongst themselves is recognized in the words of an American folk song. I can only remember part of it; no doubt an Internet search will fill in many more lyrics! "...way down yonder in the pawpaw patch. Way down yonder in the pawpaw patch." Sounds like a close-growth habitat to me! Good info lon.. The three I have in are seedlings and the distance falls at about 8ft apart. Two of them are doing great but the third I was gonna jerk out a month ago. Close inspection revealed that the third one is ALIVE dispite having not recieved a single drop of bonus water during these last few scorching weeks. The struggling plant gets until next spring before I pull it and put in a named grafted variety should it chose not to thrive but it had better make up it's mind!! The struggling plant is just messin with me. I'm a big fan of axing things that don't die or thrive. This guy just slipped through and I did not have a replacement. It is odd that Paw paw's have never come into commercial use. In my honest opinion, they are no more delicate than an avocado, or a mango, which they seem kind of between. I use them in banana bread recipes, and it tastes the same as with bananas. Peeling them really is like a mango or avocado. Apparently they aren't difficult to cultivate since they are often offered for sale. It can't be the difficulty of getting them to produce, I can think of many crops that are just as difficult or more difficult. I looked online and although I found some great links and great reading, I still don't know why they are not commercially available, as a fruit. Perhaps it is the mix up with papaya? Very odd they are not a fruit offered at health food stores or grocers. In one recipe here, they call for canned pawpaws, but the only canned ones I find anywhere are actually papaya. So the confusion remains. Each order contains two pounds of pawpaws, freshly plucked from the rolling hills of Southeastern Ohio. You will receive anywhere from four to six pieces (per pound) of fruits, depending on the size, shape and variety, and the year's weather conditions. Every attempt is made to stagger the fruitsÃ¢â‚¬â„¢ ripeness, so some are ready to eat when you open the box and others can be placed in the refrigerator to ripen over several days. The fresh fruit season typically begins around the end of August and lasts into mid-October. It is a short window of time, so place orders in advance if possible. Please place orders for fresh fruit in late August. The fresh fruit is only available from then until mid-October. Re: Paw Paw. Can you grow it in clumps?? 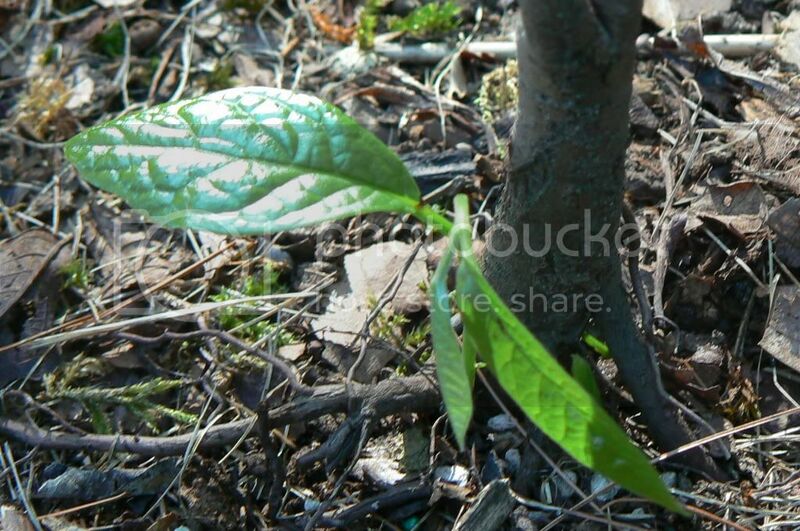 Pawpaws can be grown close together in clumps and they do so in the wild. Close planting would probably improve the chances for pollination which is usually a problem. Pawpaws are pollinated by flies and beetles but not by bees. The flowers are both male and female but the female pistils mature first and then shut down before the male anthers release their pollen. Two genetically different trees are necessary for pollination. 'Mango' is said to be the fastest growing but its growth is nearly the same as 'PA Golden' and others. There is little difference in growth rates among different varieties but there can be considerable differences among individual trees. I have one PA Golden and some 5 year old, 6 foot seedling trees but none have fruited yet. Perhaps next year. I agree with those who suggest Paw Paw would be OK in tight proximity to each other. I wasn't even thinking of the pollination factor but it sounds like it would be a great benefit. They do say throw something stinky in with the plants to attact flies. Well Lady OZ says she like them so I'm going with it. I have a few out now but all are seedling that haven't even flowered yet never mind set fruit. I did read Lady that their lack of commercial value is due to their being very difficult to ship. You would think the would breed a few varieties that ship as well as .25 inch skinned tomatoes. I have holes prepped for next spring and I figure to order from Miller's as they match my zone the best and they are generally pretty good. There sure are lts of places that offer them and ordering based on catalog descriptions alone is tough. I just wish I knew what they tasted like not that it really matters all that much. Hey Lady send me out a box will yuh?? I have read that pawpaws don't do well in soggy soil but the ones I see in the wild grow on riverbanks and in areas that are frequently flooded and they do quite well. I am not familiar with Miller's but I see they sell their pawpaws in pots. This is the only good way to buy pawpaw trees. Some nurseries sell newly sprouted seedlings and use special handling to preserve the roots. This is another possible source. Others sell pawpaws as bare root trees but their 'trees' are usually root suckers that have been dug up and bare root pawpaws, especially suckers, have almost no chance of survival. These are the sources to avoid. Larger trees are difficult to transplant and small trees require a year or two of shade before they can handle full sun so pawpaws are more difficult to start than most fruit trees. The wild ones, don't grow where the soil is 'dry' and they don't grow in the bottom of the valley where the soil is 'wet'. They do grow where there is alot of mulch, and soil that holds water well. One in the photo has a rose bush at its base, so consider what roses like and that will please the pawpaw, but roses do like more sun than pawpaw's. Take a banana, and a mango and mix them in a blender, and you almost have the taste of a pawpaw. Or take a banana and sprinkle some orange juice on it. They are very similar to bananas! But they are also a bit similar to mangoes, both I happen to like. When they are a bit green, they are even just a bit bitter like a green banana. I just looked earlier this week, they aren't close to ripe yet, still growing. I did include a link of a place that ships paw paw fruits to people. And I am planning on having seeds for folks, my hubby counted 50 pawpaw's on those two trees in photo. If I get 10 seeds each which is conservative, that is 500. I sure don't need paw paw seeds, since I probably have 24 paw paw trees that I know of, and many, many acres that I have never explored. I bet there are more groupings of them. Do you think PAW PAW can handle a Wide hole with poor drainage?? I'm willing to put in enough partially composted compost and loam and bring the whole thing up to what amounts to a raised berm/bed. I'm hoping that if I plant high drainage will become more of a mute issue. I'm gonna try the clump idea with 4 or five including a named variety in one poorly drained but rich location. No guts No glory in the planting world. It's hot but I'm still digging holes!!! !and they are for next year!